A massively thorough study – funded in part by a pair of US oil billionaires who are opponents of climate-disruption remediation – has come to the conclusion that the earth is, indeed, warming. In fact, it's warming just as much as more-limited studies conducted by the US National Oceanic and Atmospheric Administration, NASA, and the UK's Met Office Hadley Centre for Climate Change said it was: about 1°C since 1950. 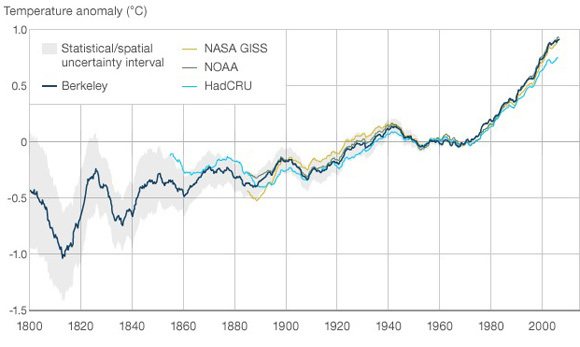 The study – the Berkeley Earth Surface Temperature (BEST) project – was set up by a University of California astrophysicist who was concerned about the "climategate" dustup over email messages hacked from the UK's University of East Anglia (UEA) that led many observers to believe that climate data had been fudged to exaggerate global warming. The core of UC Berkeley scientist Richard Muller's concern was not, however, that the UEA scientists were getting a raw deal; in his opinion they had brought the worldwide criticism upon themselves. "I was deeply concerned that the group [at UEA] had concealed discordant data," Muller told BBC News. "Science is best done when the problems with the analysis are candidly shared." Muller gathered together a group of 10 prominent scientists – among them recent Nobel Prize winner Saul Perlmutter – to creat BEST. Funding was provided by such disparate sources as Bill Gates ($100,000) and the Koch foundation ($150,000), the latter accurately described by the foundation managing the funding as an organization "whose animosity towards action on climate change made the Berkeley project look yet more suspicious to some climate-change activists." The BEST team, however, had a stated goal of neither proving nor disproving global temperature increases. As expressed by project cofounder Elizabeth Muller, Richard's daughter, the goal was to conduct an analysis so data-rich and objective that it would "cool the debate over global warming by addressing many of the valid claims of the skeptics in a clear and rigorous way." The "valid claims" didn't survive. For one, skeptics have charged that previous studies were done with selective data sets, but BEST lead scientist Robert Rhode points out that his team's analysis "is the first study to address the issue of data selection bias, by using nearly all of the available data, which includes about five times as many station locations as were reviewed by prior groups." The data set was large, indeed: temperature data was gathered from 39,028 sites, collected by 10 different sources, resulting in 1.6 billion data points. Another objection that has been raised is that temperature observations over the decades have been influenced by sensors being encroached upon by human development – the "urban heat island" (UHI) effect. The BEST analysis, however, found this effect to be negligible at best.